December 14th, 2017. I was lying down at home in full-on “recovery mode” following my back operation, contemplating all of the guidance from my consultant and my physio. Beyond the immediate recovery from the surgery, I knew there was a lot of work to do to regain a reasonable amount of mobility. Years of adapting my movement to minimise the pain and discomfort have left me with quite heavily restricted movement in some areas, and seeing the faces of both my consultant and physio when they realised this gave me a real kick from behind to step up and get myself in shape. 46km. I thought about it. 46km. Far further than I’ve ever ridden in one day before. I decided to look into the event myself. In May 2006, Sam Houghton (who was a keen mountain biker) lost his battle with cancer, aged just 22. The challenge is organised in memory of Sam, and participants raise money for Cancer Research UK. Something clicked in my head – I wasn’t going to turn this down. In the condition I was in, 3 weeks post-op, I could quite easily have let this pass me by, but I couldn’t. I needed this as a goal, a target, and my word has it motivated me. Since getting the go ahead from my consultant and physio to get back on my bike, I have been building up the miles gradually, increasing the distance on road and adding in off-road riding as and when I became more comfortable and I knew my body could handle it. As well as riding and walking, I have started doing body weight exercises at home as part of Break-Point UK’s Prime Evolution programme. This is something that I begun at the end of January and the first phase runs over a 12 week period. Broken down into three sections – Mind, Body & Nutrition – the course is aimed at developing a more positive approach to all aspects of life. I’m currently 6 weeks in and already I’m seeing changes in the way I think, feel and look. I’ve never been able to get into working out before really. I’m not a gym person. Confidence issues have meant that on the occasions I have used a gym I’ve never really worked to my full potential – I’ve always been too worried about what the guy on the treadmill/bike/weights next to me might be thinking. Ridiculous I know, but they were thoughts I couldn’t keep out of my head. I still have those thoughts, but now I am learning to block them out and work past them. In a number of contexts and from a number of people I have heard recently about the impact that negative thoughts can have on our lives: more accurately the impact that removing negative thoughts can have. For example, in an endurance situation you ultimately end up with two options – either finish or don’t. Not finishing however, is a negative. So remove it. The option you’re left with now is finishing. This new mindset has led me recently to making a number of decisions that I perhaps wouldn’t have made in the past, and stepping up to things I perhaps wouldn’t have. Having always been a bit of a tech-head, I also find that gadgets that can help me, motivate me. The more I use them and learn about their potential, the more I want to use them. And this is where my trusty Garmin Fenix 3 watch comes in. I’d be lying if I claimed to use it to anything like it’s full potential at the moment, but I do use it every day to support and inform my training, and in the last few weeks I have not only been using the GPS tracking and heart rate features but also the route navigation. Having been on a quest to up the distances I have been walking and riding I have found myself straying from the beaten track shall we say. 5 minutes is all it takes to plan a route on Ordnance Survey’s website and upload it to the watch. Then it’s simply a case of selecting the route in the navigation menu, choosing which activity you will be doing, and hit go. The watch then guides you at every junction as to which way you should be going. I know this isn’t exactly new tech. Garmin actually announced the Fenix 5 two days after I bought my Fenix 3 almost 18 months ago, but what I do with it works for me and keeps me motivated. And that is what I need. At the time of writing this there are 83 days until the Sam Houghton Challenge. I have less than 12 weeks to up my fitness and do my bit for a cause close to my heart. I recently had a decision to make. For the last 10 years or more, I have been using Nikon DSLR’s. Not the smallest or lightest of cameras, especially when paired with my Sigma 50-500mm lens. The thing is though, when working for Powerboat GP, this lens is the most versatile piece of kit I’ve ever owned. It’s well priced, and has a range which makes it suitable for close-up shots in the powerboat pits and then the action shots when the boats are out on the lake and I’m stood on the bank. It’s a set-up that works for me, and I can’t see myself giving up on it in the near future. It’s not exactly easily portable though. Sometimes I want to be able to go out, grab my camera as I run out of the door and know that I’ve got kit with me that will produce the results I need without breaking my back. So I started looking at Compact Systems. The market is awash with mirrorless cameras at the moment, and each manufacturer has their own USP’s and little quirks. I’ll be honest. What swayed me in my decision was nostalgia. My first SLR, given to me by my dad when I was 10, was an Olympus OM-10. I remember my dad had a range of OM bodies in cases, and I was made up to have one like his. We would go to Oulton Park in Cheshire to watch club motor racing, and I have memories of sitting on a fallen tree at Deer Leap, watching the cars come out of Old Hall, blast past us through the dip, then up the rise to the start finish straight. After the OM-10, I was then given an OM-4Ti. Even at such a young age (probably about 15 I think) I found that this was such a lovely camera to use. When Olympus launched the OM-D range a few years ago I was intrigued. Mirrorless cameras were relatively new to the market and I didn’t know much about them. Now things have changed. There is a firm place in the world for a small-bodied, SLR style camera and their appeal has been steadily rising. And there are some good deals out there now, so I took the plunge. The Internet is a wealth of information, and when it comes to technology I’ve always found that quality reviews are easy to come by. When a review by a respected tech publication says a product “ticks boxes you probably didn’t even know about“, then it’s probably worth a shot. So I bought an Olympus OM-D E-M10 Mark II. I’ve only had it 2 days, so this is by no means a review. This is simply a post to say thank you to Olympus for creating something that both keeps up with current requirements and takes me straight back to my early days of photography every time I pick it up. Will it replace my Nikon kit? Almost certainly not. Will it go with me to places the Nikon doesn’t? Almost certainly . There’s a house beside a wheat field, and at this time of year the farmers and their combine harvesters begin to reappear. The wheat field’s edged with Poppies, red beacons shining bright like guardians defending their Kingdom day and night. The time has come to bring in the crop, as every year dictates. The machines arrive to do their job, the guardian’s fate awaits. The wheat is cut, the field bare, this season’s so demanding. And there beside the empty field is this…the last man standing. My daughter, who will be 4 in November, can be such a poser. She loves to “get beautiful”, putting makeup on in the mirror and most of the time she loves having her picture taken. This afternoon we were outside and I happened to have my camera to hand. Walking by a recently harvested field, she started to play on the edge of it, kicking up the loose bits of straw. She spotted me taking her picture and these are the results. I don’t think I could write a race report. Not in my current role anyway. In my understanding, writing a race report requires you to focus your attention on as many aspects of the race as it develops as possible. Sure, in some cases it might be possible to look back over lap charts from race control to ensure accuracy of reporting, but you also need to watch the race as a whole. What I see during a race is almost completely through my viewfinder. Framed, almost like watching it on TV. That said, I’ve just spent two days watching for things that might be about to develop. The Lowestoft Grand Prix provided entertainment across all the classes. One of the first things that struck me was how quick Scott Curtis looked in qualifying. Considering how recently he had got his hands on the boat he was showing blistering pace. Watching the attitude of the boat on the water you could see that he was on it. I watched him round the top turn and head towards the club house, then the gasp from the crowd caught my attention. It happened so quickly. In a fraction of a second, Steve Hoult was going skyward. Looking up I saw his boat, pointing very much in the wrong direction. I pointed my camera and caught from the moment his Molgaard touched down and barrel rolled to a rest. I then did what I always do when I catch an accident – I watched to see that the driver was safely out of the boat. Seeing him standing on the Osprey Rescue boat, I let out a sigh of relief. The boat had suffered extensive damage. The right sponson had been completely removed, the deck split, screen and other body panels cracked, and of course the engine had been submerged. All fixable, but not in time to race. With what turned out to be the only major incident of the weekend behind us, my focus returned to the racing; and what a display of racing it was. The level of maturity and standard of racecraft demonstrated by the young GT15 drivers was outstanding. F1 Atlantic GB’s Harvey Smith, putting his new Povvat hull through it’s paces, pulled out a great lap in qualifying to take pole for Race 1, but Thomas Mantripp’s race start was enough to see him lead as they passed the crowd on the bank for the first time. The grit and determination shone through though, as each and every driver did what they could to maintain their position or make their way through the pack. The GT30 class was equally entertaining over the weekend. 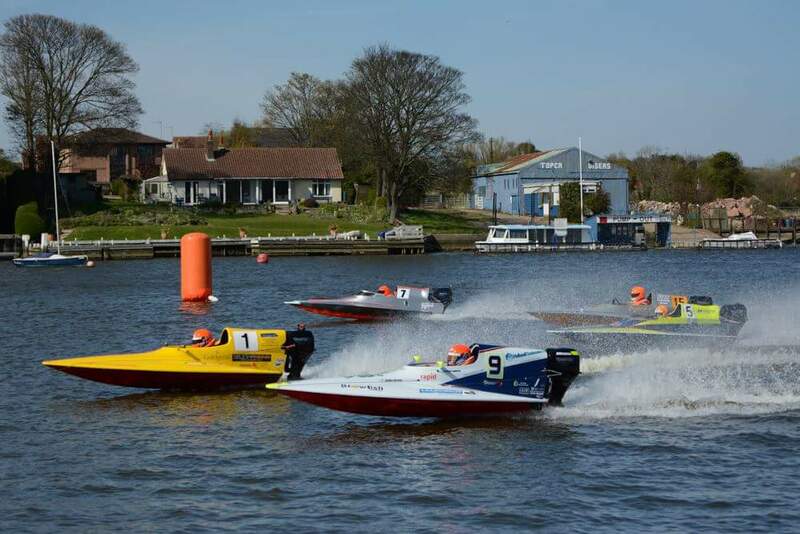 In qualifying, Ben Jelf picked up where he left off last year, at the front, and Thomas Mantripp showed promising form in his first National outing in the class by taking second. Tiegen Goodfellow impressed with a great drive to third on the grid, but it was with her starts that Tiegen really made her presence felt. Rocketing away from the start pontoon, Tiegen established herself firmly in second place after the first turn; a position she would claim as her own in all the races of the event. With Thomas Mantripp now down in third, he found himself beginning a weekend long battle with Jack Pickles. 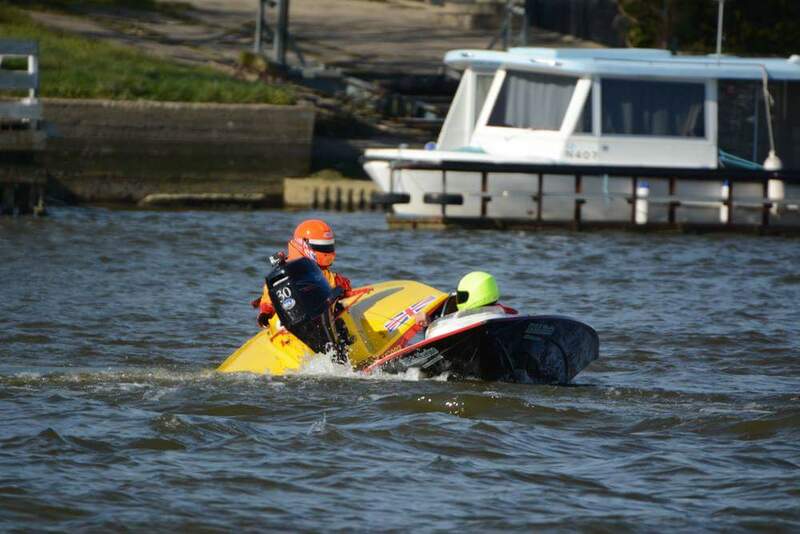 Race 1 had to be restarted after Jack hooked in front of Thomas in the Wherry Turn and the two boats collided, becoming locked together in a slow spin. Neither driver were injured in the incident, but their emotions were clear out on the water. I saw the two drivers after their first race, shaking hands and checking each were ok. It was great to see. From here on in, the rest of their weekend seemed to be spent chasing each other round the course, both displaying great driving skill and putting on a really good show. The OSY400 class, made up of three regular drivers and two who switched from Hydro’s, was a display of spectacular driving. Luke Hugman and his new boat set the pace from the off, and it was great to see Jason Mantripp settling into his new boat so well. For anyone who isn’t familiar with OSY’s, the driver lies on their front in these boats, controlling the throttle with their left hand and steering with their right, and they are stunning to watch. The F4 class saw three newcomers, Leon King, Matt Wood (switching from T850’s) and Ben Jelf, taking on established racers Rob Veares and Sam Whittle. Again it was reigning champion Sam who dominated the weekend, but from my viewpoint the closest racing was that between Ben and Leon. The determination of these two drivers was clear for all to see. Returning to the F2’s, Scott Curtis continued his qualifying form, driving a blinding Race 1 to finish second. Colin Jelf dominated the weekend, with Paul Balfour following a close second. From my point of view, these boats photograph best when right on the edge. Don’t get me wrong, in the flesh they’re impressive no matter how high out of the water they are, but a photograph needs to make a statement. 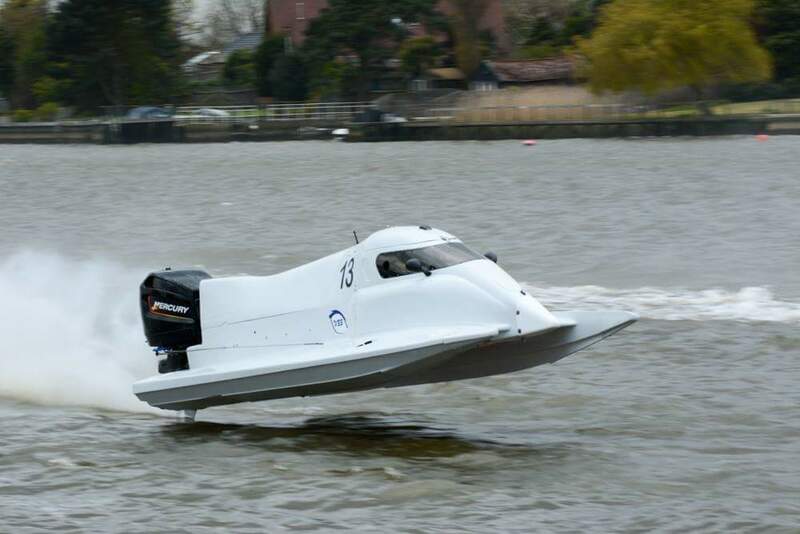 Matt Palfreyman’s Moore boat is yet to have it’s livery applied for this year. Apart from one small sticker it’s plain white. It’s a beautiful boat, but not that exciting to look at. Until Matt gets it going. Lap after lap, Matt would exit the turns and stand the boat up, accelerating hard down the straights, crossing the prop wash of boats in front trying to give himself the best line, at times literally flying the boat. 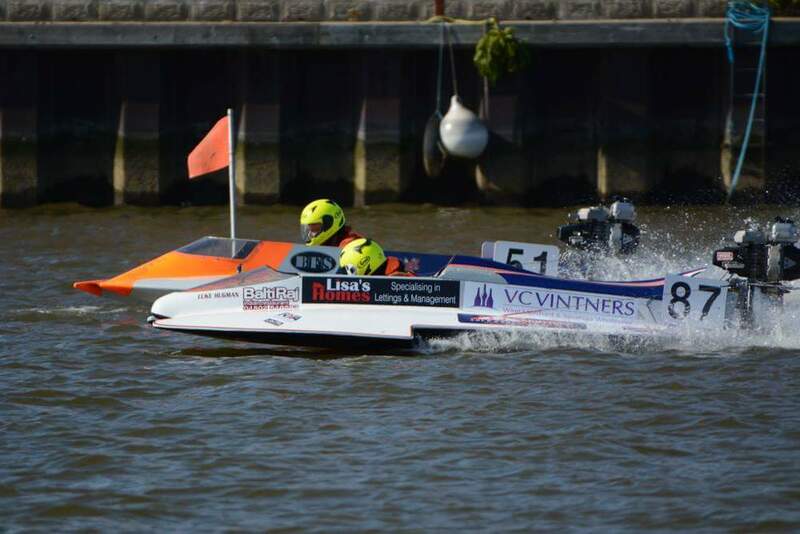 All in all, the Lowestoft Grand Prix was a great weekend. 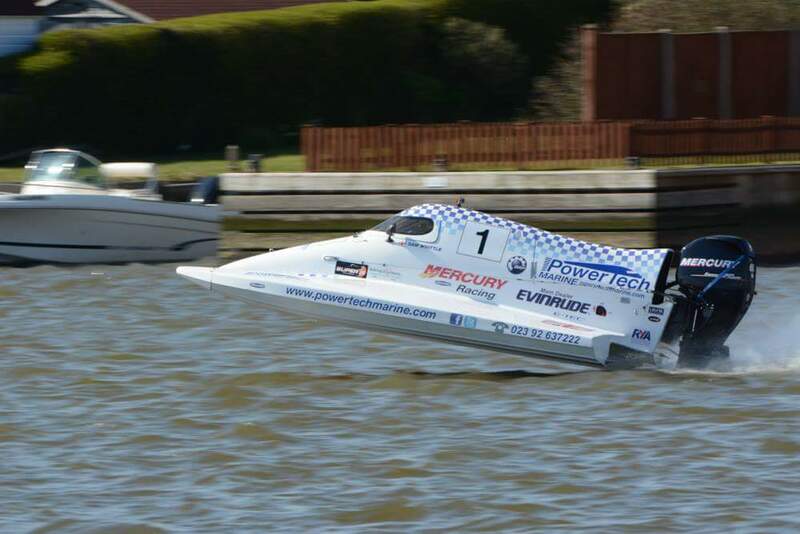 On display was great racing, great sportsmanship and great entertainment, and in a little over three weeks Powerboat GP heads north to Carr Mill to do it again. I for one can’t wait. Farewell to Vulcan XH558. The end of the 2015 display season marked the end of the iconic Vulcan’s display life, and Southport Airshow marked another milestone in this aircrafts active life – it was the final ever time it flew in close formation with the RAF Display Team, The Red Arrows. I’ve always considered the Vulcan to be a beautiful aircraft, and it played a hugely important role in the Falklands (when I was not yet 1 year old) but it wasn’t until two years before the end of it’s flying life that I managed to see it airborne. Two years later, at one of the last displays of the season, the Vulcan stole the show. The Red Arrows with their amazing close formation flying were spectacular, paying homage to the Spitfire to commemorate the 75th anniversary of The Battle Of Britain. The Eurofighter Typhoon put on a phenomenal display, power-sliding through the sky, cranking up the reheat and creating it’s own clouds. In fact, every aircraft that took to the skies commanded the attention of the huge crowd lining the front, but I have never heard an applause like that which erupted from the seafront as XH558 banked for one final time and flew off into the distance. 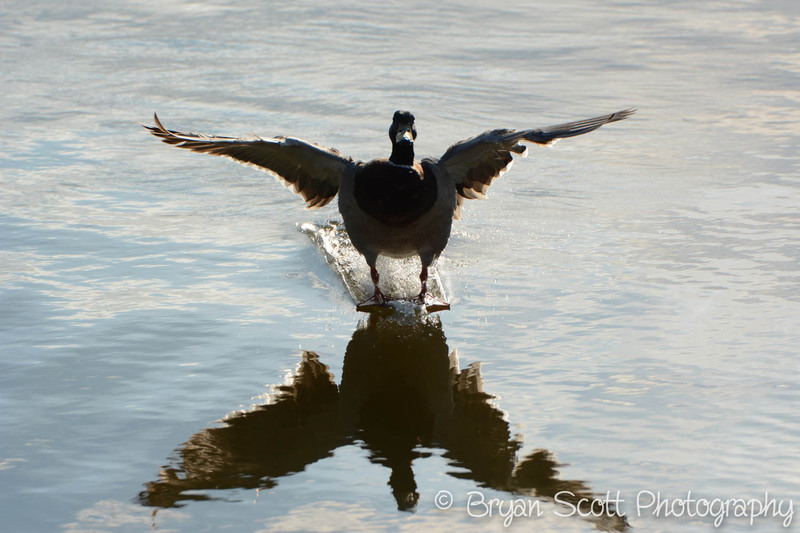 I have always enjoyed photographing birds, and on Mothers Day my family and I took a trip up to Martin Mere. My wife used to visit the reserve as a child and going back there with our own children is something we both really enjoy. In some enclosures the birds roam freely, crossing the paths. In a lot of others the birds can be as close as an arm’s length away. This proximity provides opportunities to get some great close up shots.